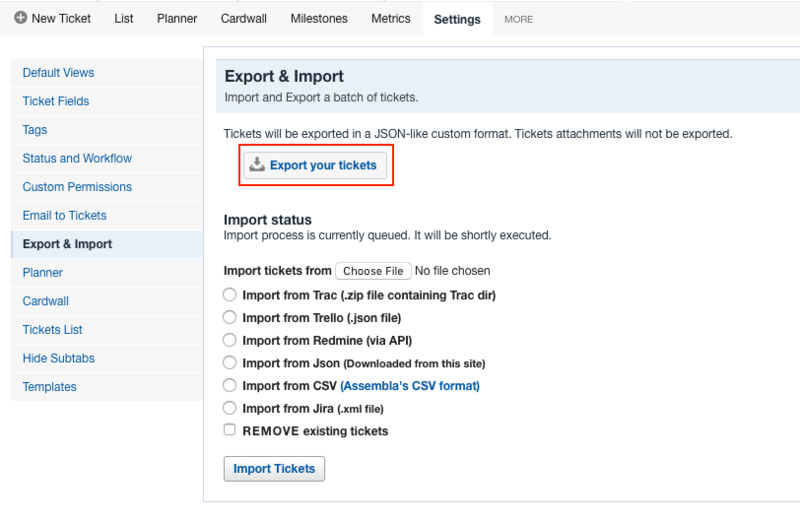 The tickets export file can be found in Tickets tool > Settings > Export & Import. Note: It doesn't include attachments. Once you are in the Export & Import page, click on the Export your tickets button and it will generate a link which will contain your file. Note: The tickets file will be a .bak backup file. To import your files in another space, go to the same path (Tickets tool > Settings > Export & Import). Browse for your file in your local machine and then select the option called Import from Json (Downloaded from this site) and click on the Import Tickets button. Note: If you mark the REMOVE existing tickets checkbox, it will remove all the existing tickets in that space. If you don't want to do that, do not mark it and your imported tickets will be added to your space with the existing ones. Remember to invite all the users to your space if you want them to continue working with the tickets they are assigned to. Also, keep in mind that the person who imports the tickets will be set as the creator of all the tickets.